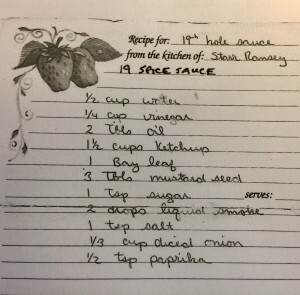 My friends Jim and Starr Ramsey gave me this recipe many years ago and we usually have some on hand. Jim and Starr were the ultimate grillers; grilling 3-4 times a week, no matter what the weather. It didn’t matter if there was a foot of snow in the winter, Jim would brush the snow off the grill and start a fire with real charcoal (not briquets!). This sauce may also be called Sitzmark sauce. 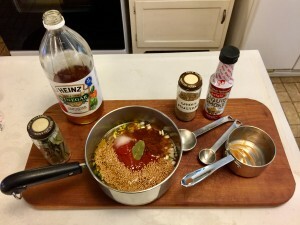 You will find some other recipes on line, however this is a simple, easy to make recipe and you may already have most of the ingredients in your cupboard. We keep the left over sauce in our refrigerator for a month or more. 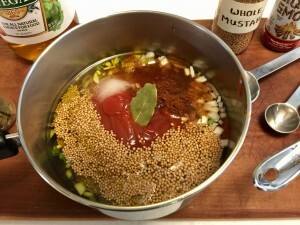 It can be used as a condiment on all kinds of beef, pork, lamb, and chicken. We normally use it on grilled cheeseburgers on toasted english muffins. 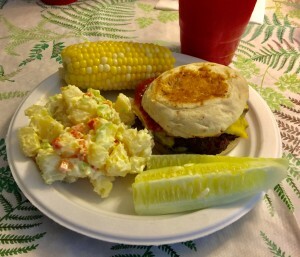 Lamb burgers are especially good! 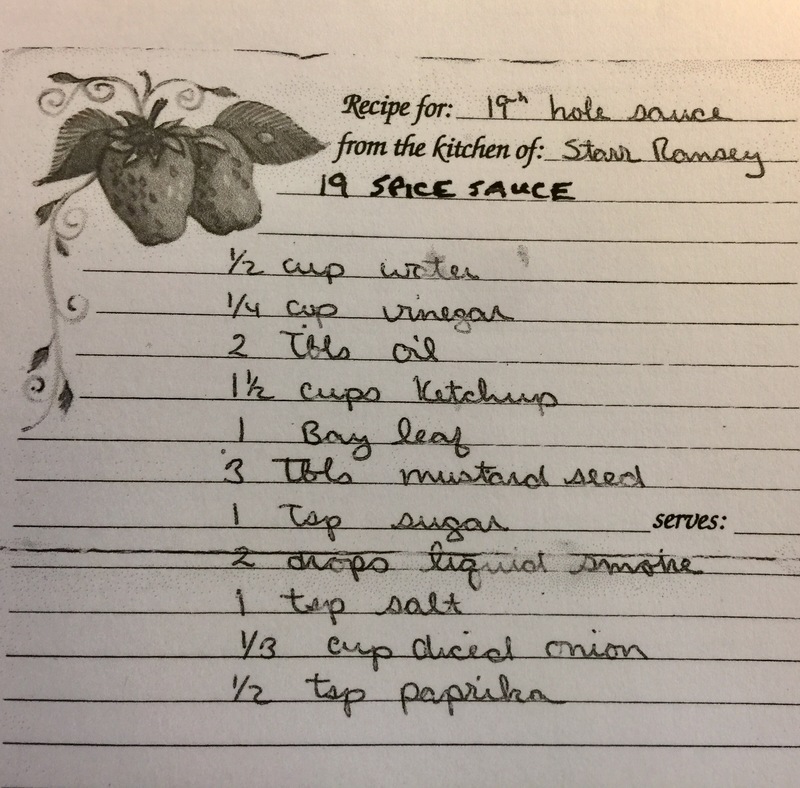 I still have the recipe as I copied it down almost 40 years ago. 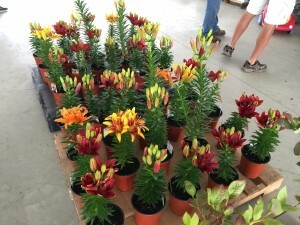 A very colorful mix of spices! 1) Combine all the ingredients into a small sauce pan. It really doesn’t matter what order the ingredients are added. 2) Over low heat, gradually bring to a simmer. 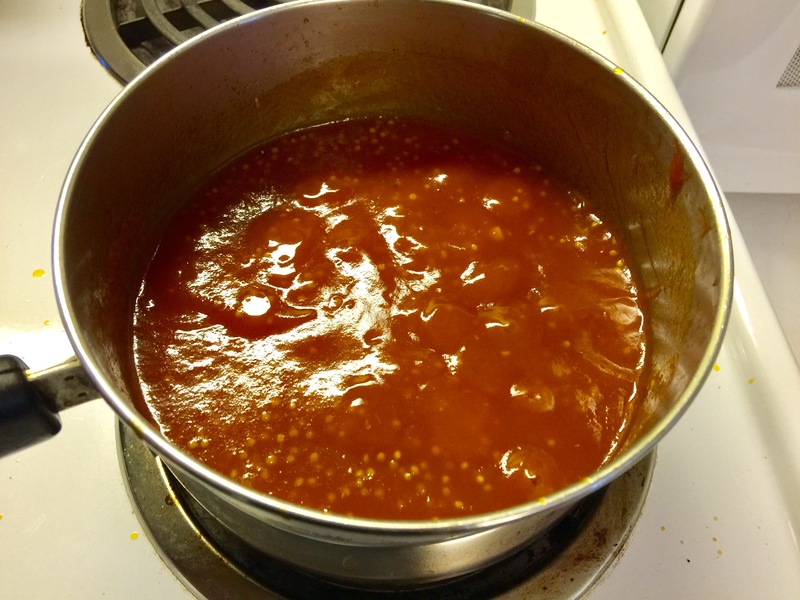 Cover and let it simmer for at least a half an hour. 3) Stir every couple of minutes to keep from burning on the bottom of the pan. 4) Check to make sure the mustard seeds are soft enough to bite into without being hard. 5) Ready to serve warm or cold. 6) Save the unused portion in a sealed container in the refrigerator. The good old Revere Ware sauce pans! 1) If you have never used Liquid Smoke, there are several brands which can be found in a grocery store. You only need a drop or two to change the flavor of a recipe, so a bottle will last you a long time. 2) Revere Ware. 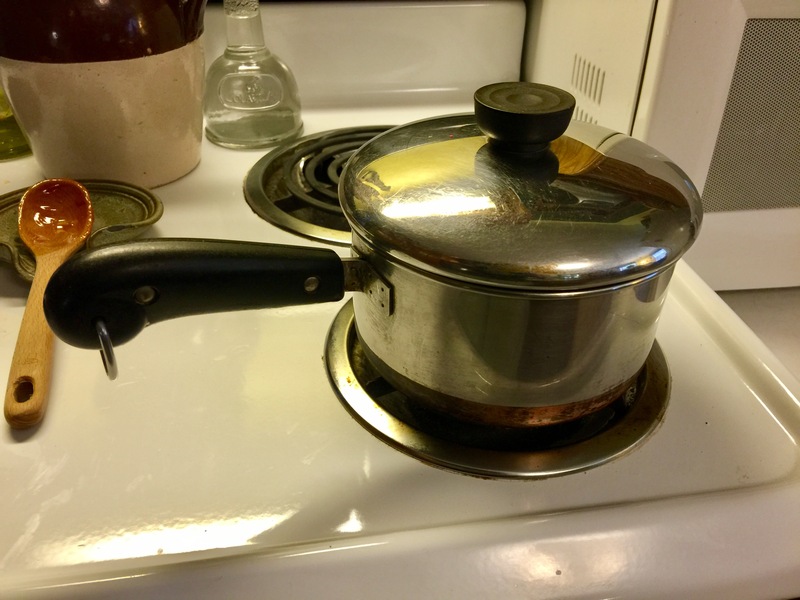 My mother always used Revere Ware, which is cookware made with lightweight stainless steel or stainless steel with a copper bottom. If you don’t burn what you are cooking, these pans are easy to clean and last forever. I prefer to use the old style Revere Ware that you can buy used on Ebay at a reasonable price. I have all the high priced gourmet cookware, but I always seem to cook with the Revere Ware when it comes to sauce pans or large 6 and 8 quart pans. The older Revere Ware is not “non-stick”, so you can use metal spoons for cooking and “Scotch-Brite” pads for cleaning. We primarily use this sauce on hamburgers and cheeseburgers. 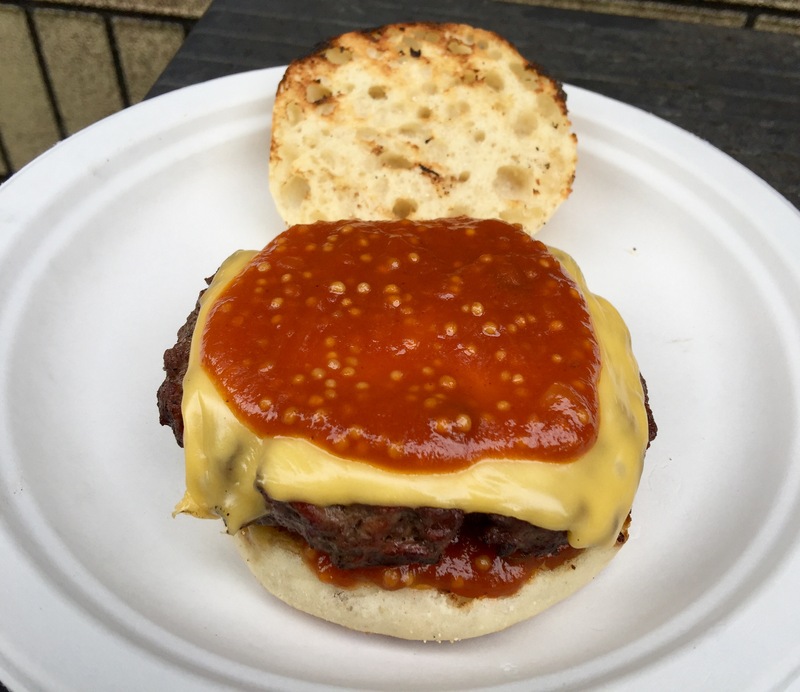 We especially like the combination of Cheeseburgers, Sharp Cheddar cheese slices, with 19th Hole Sauce, on a grill toasted english muffin. 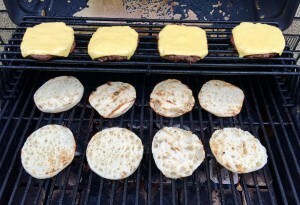 Grilling the burgers with toasted English Muffins and Sharp Cheddar Slices! A little sauce on top and underneath the burger! We usually eat our burgers with other common “Picnic” foods, no matter what time of year. We try to get some vegetable in our diet at the same time. Enjoy! 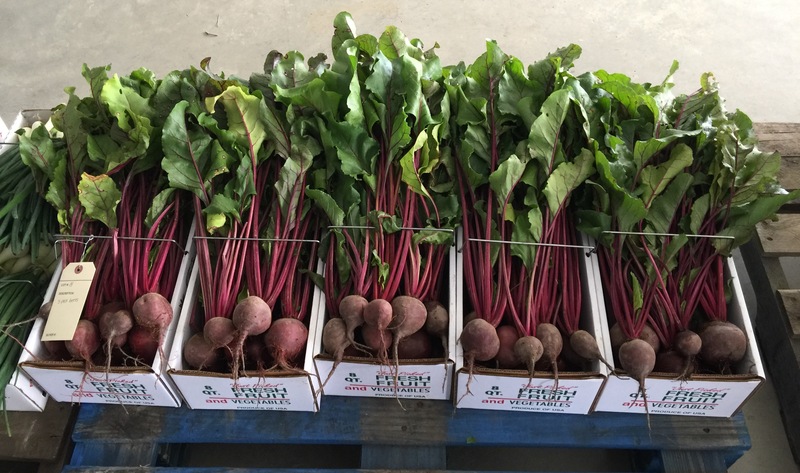 One of our favorite things to do is to visit the Genesee Valley Produce Auction. 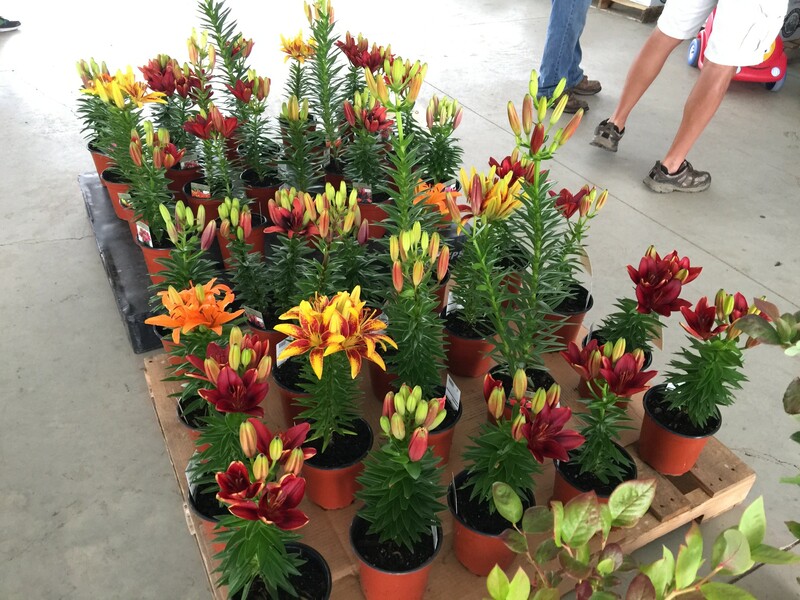 We visited the auction for the second time in 2017, just before the Fourth of July weekend. The auction is getting into full swing for the summer with a full parking lot of buyers and a variety of produce items for sale. Be sure to take note of the changes of auction days and hours described below, for Summer 2017. 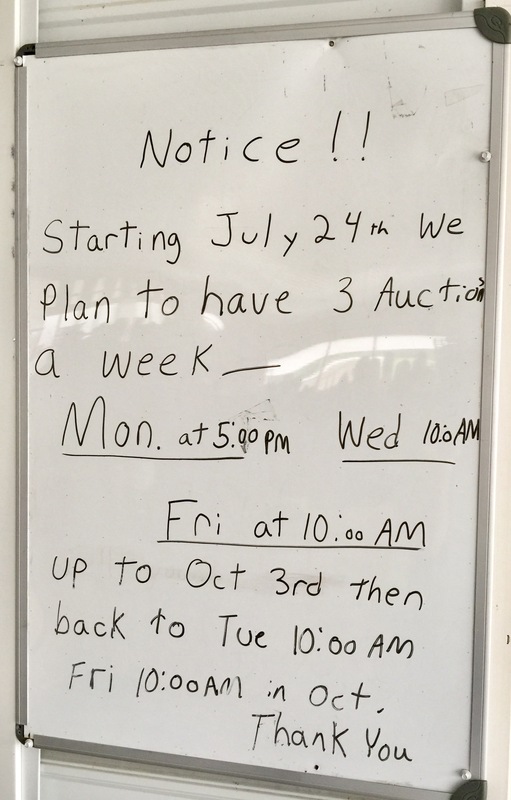 The biggest change we noticed is an increase in the number of days the auction will be open this summer. I am sure this reflects the increase in the number of both buyers and producers in the local geography. There was a sign posted announcing the new days and hours. Wether buyer or seller, be sure to enjoy the auction!! 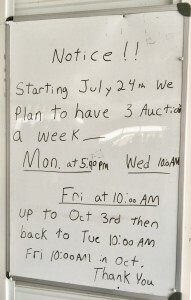 Starting July 24th – October 3rd, we plan to have 3 Auctions a week. and Friday at 10:00 AM. 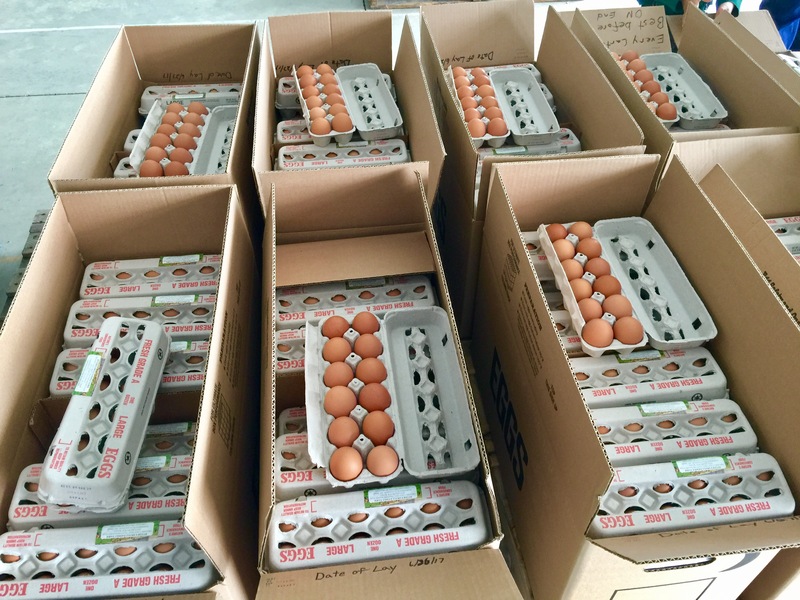 Some of the items for sale this past week included, eggs, beets, flowers, local strawberries, black raspberries, cucumbers, peppers, rhubarb, kale, cauliflower, carrots and onions. 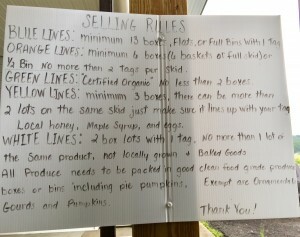 For sellers, we took a photo of the “Selling Rules”. 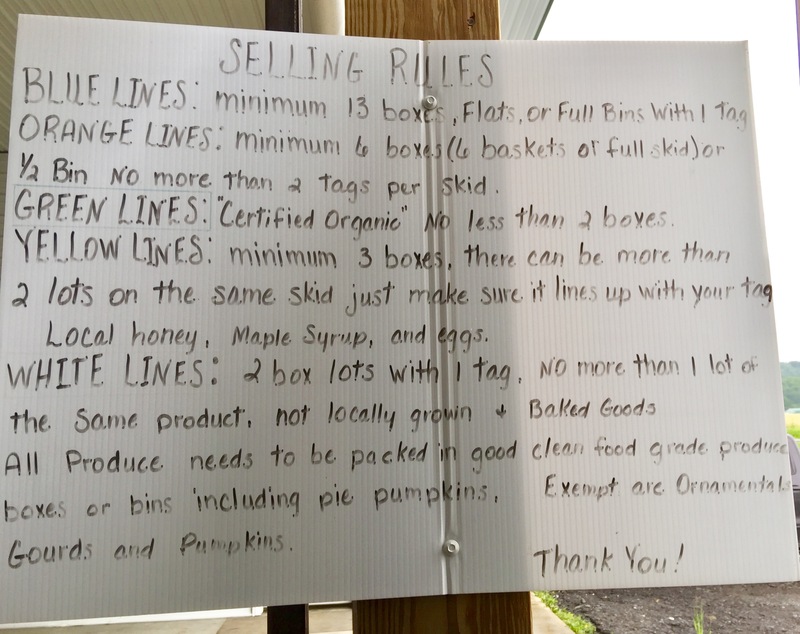 Not being a seller, we aren’t certain of the meaning of all the selling rules, but we are certain you can ask questions at the auction for clarity.